Will The FANGs Lag During A Period Of Faster Economic Growth? In the lead up to and after the November election a significant change in stock leadership has been underway. The better performing sectors are those that will benefit from faster economic growth and a steeper yield curve (like the banks.) Seemingly left behind, or at least underperforming, are the technology stocks as can be seen in the below sector performance chart. One area of technology that generated out sized returns in 2015 was related to internet and social media companies. The favored group of stocks called the FANGs (Facebook (FB), Amazon.com (AMZN), Netflix (NFLX) and Google/Alphabet (GOOGL) were a beneficiary. The below chart shows the significance of the 2015 FANG returns. E-commerce retailers are likely to continue their dominance and be the primary beneficiaries on Black Friday. 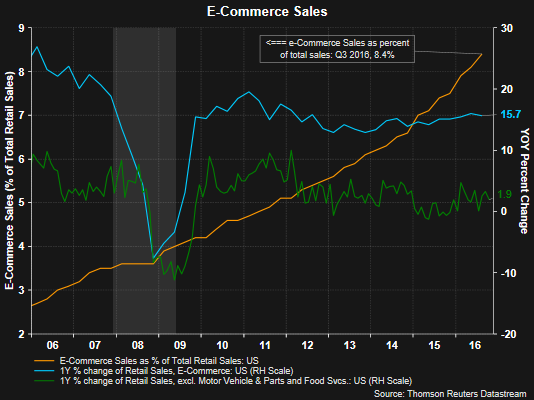 As the below chart shows, e-commerce sales continue to garner a larger percentage of overall retail sales with traditional brick and mortar retailers stuck in a no growth environment. Further detail on third quarter e-commerce sales can be reviewed in the U.S. Census Bureau's recent e-commerce sales report. 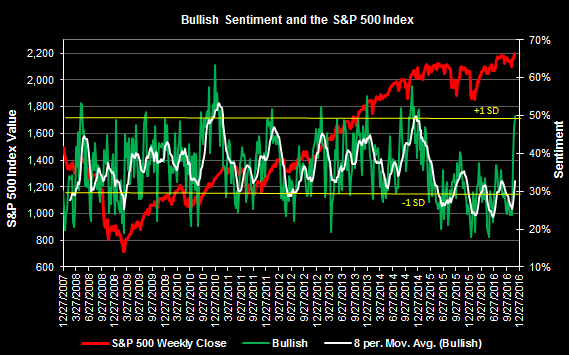 The American Association of Individual Investors released their Sentiment Survey today and bullish sentiment is reported at 49.9%. This is slightly above the +1 standard deviation level of 48.4%. As can be seen in the below chart, the bullish sentiment level has spiked higher subsequent to the U.S. presidential election from a few weeks ago. Although not shown on the chart, the bull/bear spread widened to +20.1 and is the widest level since November of last year. Individual investor sentiment measures are contrarian ones and at their extremes frequently coincide with market reversals or pullbacks. Given the strength of the market averages since the election, an equity market pullback or consolidation would not be surprising and actually healthy for a next move higher. Today the Dow Jones Industrial Average Index closed at another record high of 19,083.18, crossing another 1,000 point interval on Tuesday. It has taken nearly two years for the index to breach this 1,000 point interval after breaking 18,000 in December 2014. The market advance following the election is beginning to sound like a broken record as commentators announce the market's close at a "new all time high" at the end of each trading day. Emotionally, it feels as though the market is due for a pullback, and for investors in cash, a pullback is being hoped for. A pullback will come just as night follows day; however, the market being a weighing machine as it is, a better investment environment continues to get more priced in based on potential policy changes in Washington. Turning to the broader S&P 500 Index, the S&P is up 5.6% since the beginning of election week and up 20.4% since the February 11 taper tantrum low. 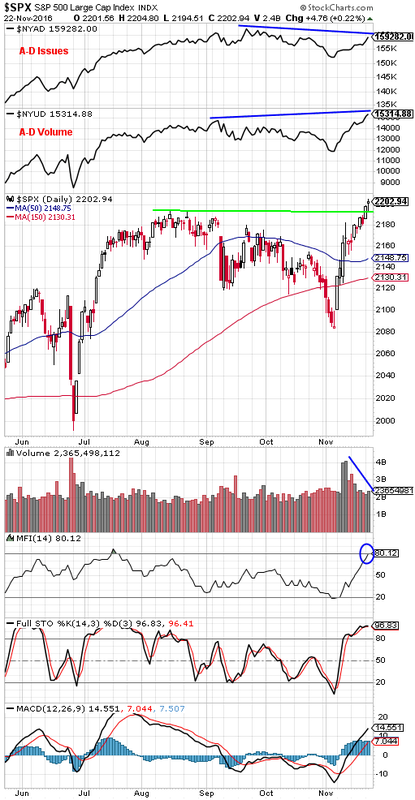 Setting emotions aside and looking at the market technicals, the money flow index and the stochastic indicator appear to indicate the market is near overbought. In the early days following the presidential election, the equity market seems to be anticipating better economic growth in the years ahead. Knowing the economy is not the market though, investors believe a better economy will translate into stronger corporate profits as well. When the new administration takes office in 2017, Trump's campaign comments indicate the economy is in need of more government spending, specifically on infrastructure and the military. Additionally, a Trump administration has promised tax reform, and specifically tax cuts. History does not necessarily repeat itself perfectly; however, it does tend to rhyme. 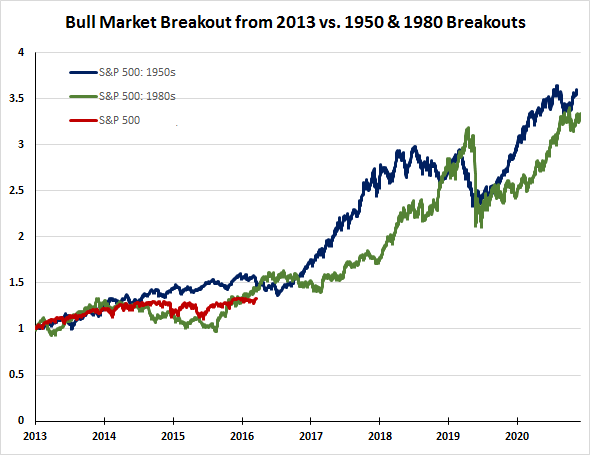 The below chart overlays the S&P 500 Index from September, 2013 compared to the bull markets of the 1950's and 1980's. Trump's anticipated policies do have similarities to policies pursued in the 1950's and 1980's and those two decades were periods of a strong bull market. The decade of the 1950's followed World War II and pent up demand saw the Gross National Product in the U.S. more than double from 1945 to 1960. Government spending in the 1950's was targeted at construction of the interstate highway system, building of schools and an increase in military spending. A Trump administration is indicating a stimulus program would focus on infrastructure and the military. The decade of the 1980's was know as the Reagan Revolution. A focus of President Reagan's policies was reducing the tax burden on Americans, lowering government regulation and shrinking government itself. During Reagan's years in office, he cut the top tax rate from 70% to 28%. President Elect Donald Trump also projects to implement similar policies as Reagan, i.e., reduce regulation, shrink the government and lower taxes. The 1950's and 1980's were good decades for equity investors. President Elect Donald Trump is projecting he will pursue policies that look similar to those implemented by presidential administrations of the 50's and 80's. If Trump's policies have a similar impact as those in the 50's and 80's, the coming years could be rewarding for equity investors. 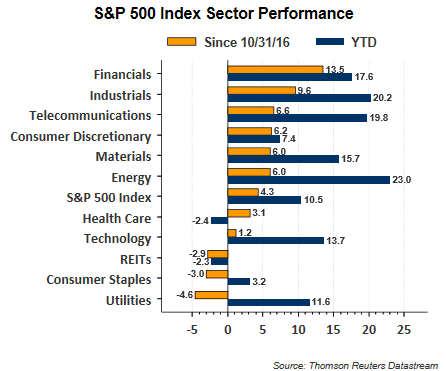 The market action following last week's election has seen powerful rotation among stock market sectors and industries. In my last post I highlighted this movement along with stocks and industries that are benefiting from this rotation and industries that are not benefiting. I noted a potential caution due to the fact the targeted sectors seems to be a consensus trade by investors and the moves may be occurring too quickly. 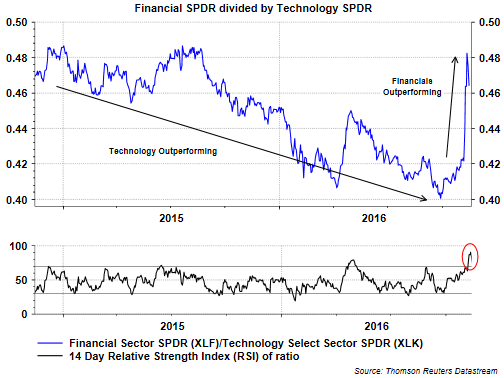 One area benefiting from the rotation is the financial sector at the expense of the technology sector as seen in the below chart. Tossing aside ones political leanings, the stock and bond market are telegraphing positive results from a Trump presidency as it relates to the economy. 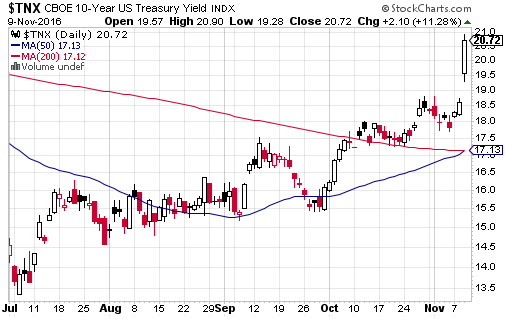 I briefly touched on the bond market in yesterday's post and below is another chart of the 10-year Treasury yield-the yield continues to move higher. In Monday's post I highlighted the importance of separating ones politics from their portfolio. The market's reaction to yesterday's election outcome is a perfect example why this is important. 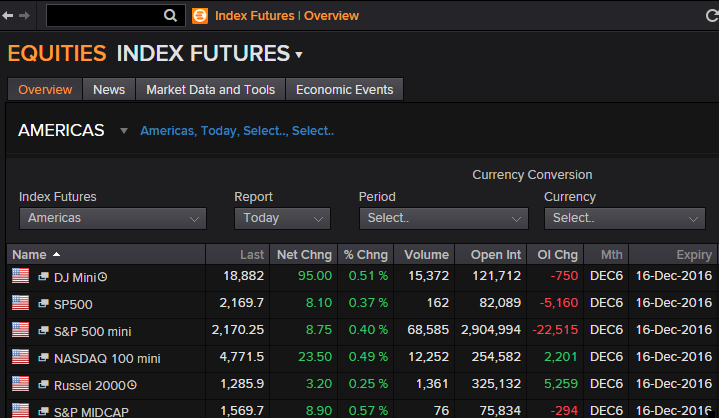 As election results trickled in last night and it became apparent Donald Trump would be the 45th President of the United States, equity futures sold off sharply. The day after election sell offs are not unique. The market sold off 2.4% after the 2012 election and sold off 5.3% after the 2008 election. The Dow futures were down over 860 points at one point early this morning. In spite of this initial negative reaction, today the Dow Jones Industrial Average closed up 256 points at 18,589 after reaching an intraday all time high of 18,650. At the end of the day, stocks will trade on fundamentals and whether or not one is a Trump supporter, his policy proposals could be very bullish for the economy and stocks. Today's market action is a reflection of this potential positive. Additionally, stock prices follow earnings and it looks highly likely third quarter S&P 500 earnings growth will be positive for the first time since Q1 2015. Q3 2016 earnings growth is tracking to be up 3.9% and 7.5% ex-energy. The bond market sold off rather sharply in a potential sign investors anticipate a faster pace of economic growth. 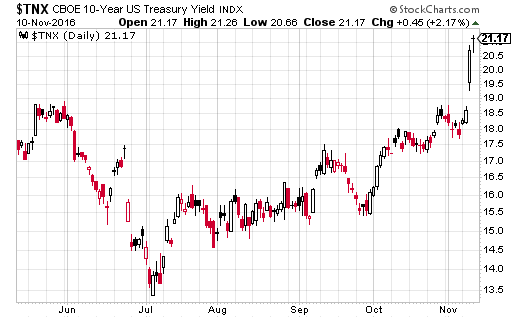 The 10-year Treasury yield closed at 2.07% and is the highest yield since reaching 2.1% in January of this year. The market will certainly not move higher in a straight line. Also, the Fed rate decision in December may also create some equity market volatility. However, the election outcome in and of itself may not be bad for the economy and thus could be good for stocks. Separating emotion from fundamentals remains an important characteristic for investors. In one day the S&P 500 Index recovered six of the nine days of losses incurred over the last two weeks. Today the S&P 500 Index recovered 46.34 points or 2.22% versus the 66.15 point loss (-3.07%) incurred from 10/25 through 11/4. Today's rally did not occur on exceptionally high volume, but the stochastic indicator has turned positive. Charles Kirk of The Kirk Report made a couple of observations in his strategy note over the weekend. Separate your politics from your portfolio as the combination of the two frequently proves unproductive and unprofitable. If the market continues to decline after the election, it would do something we haven't seen in some time – namely that those selling into weakness have made the correct decision to do so. This market has consistently punished selling into weakness like we've seen of late so, if the market punishes those who haven't hedged, raised cash, and position more defensively, it would be the first sign that a top has been made for the market. Kirk states, "My personal view is that the market will rally significantly no matter who wins the election. The way I think it will continue to go consistently down is in a contested type situation (like a Gore/Bush) which would continue this period of tremendous angst and uncertainty for markets worldwide. I could be wrong as I am often about such matters, but that’s my two cents worth"
Tomorrow is the election and recent market activity is suggesting continued volatility. LPL Research publish a post, What Happens Historically After Elections?, that is a worthwhile read for investors as election day is finally upon us. With today's market close the S&P 500 Index has been down for nine consecutive trading days. The index is down 4.2% from the August 15 high, but remains up 4.1% year to date. 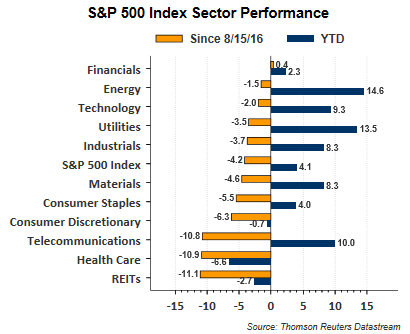 However, during the pullback from the August high, most of the traditionally defensive sectors have been the worst performing ones. As can been seen in the below bar chart, REITs are down 11.1%, health care is down 10.9%, telecoms down 10.8% and consumer staples are down 5.5%. In five days the U.S. election will be behind us, absent a contested outcome. Through yesterday's close, the S&P 500 Index has been down seven consecutive days putting the Index down 4.2% from its August 15 close. This weakness in the markets is now showing up in technical indicators like the CBOE Equity Put/Call ratio. 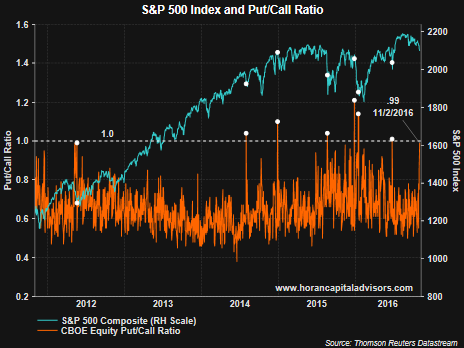 At the close Wednesday, the equity put/call ratio was reported at .99 which is an indication of extreme equity market bearishness from which rallies tend to occur. Other technical market indicators are also indicating a market that is oversold or at least near oversold. 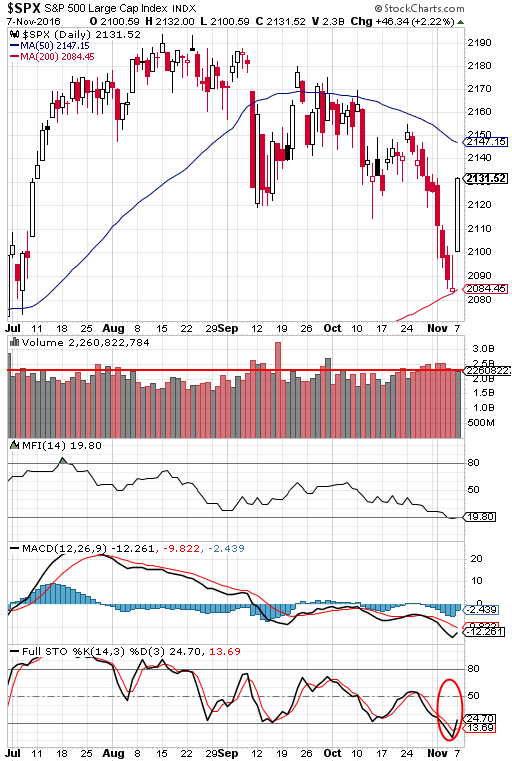 As can be seen in the below market chart, the stochastic and money flow indicators are at levels that have coincided with an oversold market. 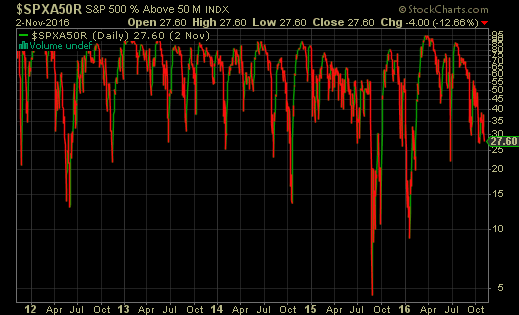 And lastly, the percentage of S&P 500 stocks trading above their 50 day moving average stands at 27%. In summary, investors seem to be positioned for a market that reacts negatively to the election outcome. 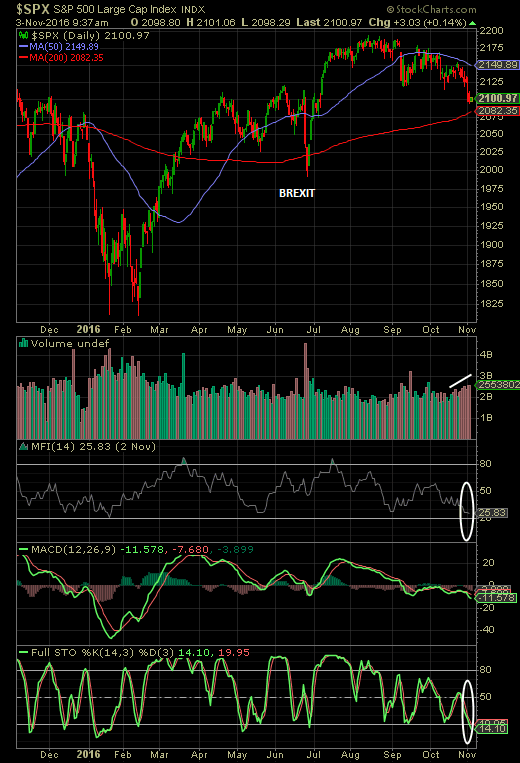 As the second chart above shows, the market's reaction to the BREXIT vote was certainly negative; however, the sharp decline was fully recovered within a week of the BREXIT results. And from a fundamental perspective, the earnings recession seems to be coming to an end with third quarter earnings now tracking to be up 2.9% with 76% of S&P 500 companies already having reported results. With company fundamentals/earnings turning more favorable and equity shocks like investors are anticipating with the election outcome, the current pullback is more likely to be only temporary as we noted in our BREXIT commentary in June.